Process Materials is a full-service, thin film materials provider offering high quality products designed for the vacuum industry. 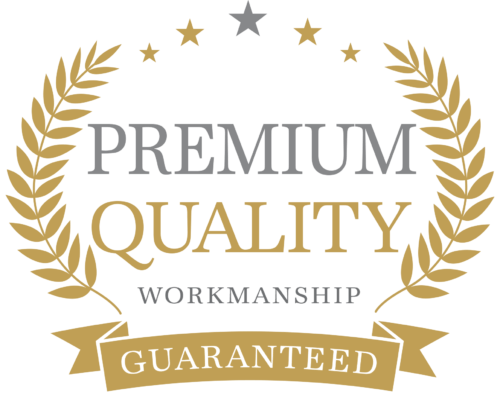 We provide product design, CAD/CAM drawings and full trace-ability and analysis of our materials. Our manufacturing capabilities range from prototyping to full production. Melting and casting, rolling, sintering, hot pressing, and vacuum-induction melting are part of our most advanced processes for the highest quality product available. Whether you need a single piece or multi-tiled construction, bonded, bolted, or clamped, rectangular, triangular, circular, or ring-shaped, pure metal, alloy, or ceramic, Process Materials is your solution. 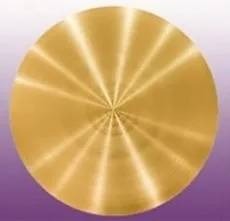 Process Materials supplies a wide variety of rotating targets in various diameters and lengths up to 4000 mm for all major PVD sputtering systems. Manufacturing technologies include casting, plasma spraying, arc spraying, wire flame spraying and pressing-sintering. We manufacture designs for magnetron-specific end blocks, including “dog-bone” configurations and with a finished or unfinished surface. We make new targets with or without backing tubes, or we remove “spent” material on used targets and apply a new layer. 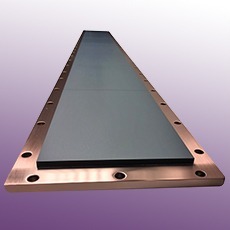 Backing plates are used to mount the target in the sputtering system, so their selection is critical. 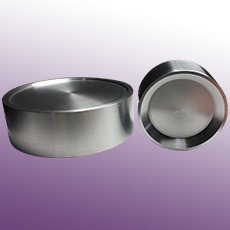 Process Materials manufactures standard and custom designs to suit your specific sputtering process. Materials used include oxygen-free, high conductivity (OFHC) copper, molybdenum, titanium, aluminum (alloys) and stainless steel in different sizes, shapes and geometries. Process Materials supplies high quality evaporation products in a full range of materials, sizes and purities. 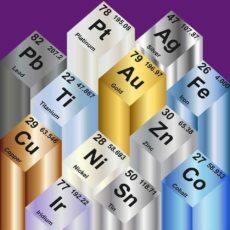 These include metals, alloys, ceramics and precious metals (Gold, Iridium, Palladium, Platinum, Rhodium, Ruthenium and Silver Ag). We stock frequently-requested evaporation materials along with rods and bars. 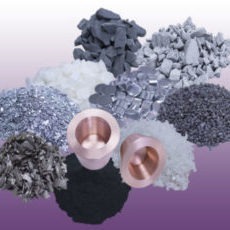 Process Materials offers a comprehensive array of high purity precious metal thin film deposition products, including single or multi-tile sputtering targets, evaporation materials (slugs or pellets) and crucible liners. Our design capabilities ensure the most efficient use of your precious metals. 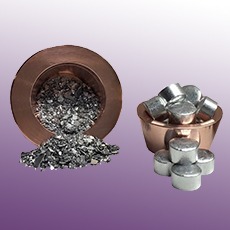 We are able to work with gold, silver, platinum, ruthenium, iridium, palladium and rhodium. 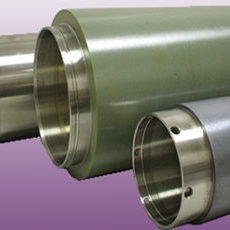 For best evaporation performance, an optimal crucible liner is imperative. Process Materials offers crucible liners made from Alumina Al2O3, Intermetallic BN-TiB2, copper, tantalum, graphite, tungsten, boron nitride, molybdenum, and vitreous coated carbon. As some materials become highly reactive when molten and may alloy to the liner, contact your sales engineer for help choosing the correct liner. Thermal shock is the most common reason crucible liners crack; always be sure to fill the liner appropriately. Process Materials, provides various forms of cathodic arc source designs and compositions. Cathodic Arc Deposition provides superior coating qualities for many applications such as decorative and corrosion resistant coatings and the hard coating industries. 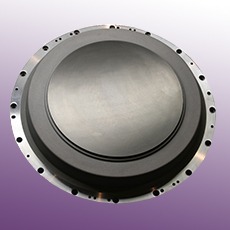 Process Materials provides such targets in circular target configurations with either a “clamp on” design or threaded pattern. Choosing the material is as important as choosing the form. Process Materials has a wide variety of precious and non-precious materials including pure elements, compounds and alloys in purities ranging from 99.9% to 99.9999% for both R&D and production. Click here for Full Listing of Materials.